On Day 19 of the Aadhaar final hearing, senior counsel Meenakshi Arora resumed her submissions on behalf of the petitioners on the impact of surveillance, the parameters of strict necessity and purpose limitation, and the test of proportionality. She referred to the judgment of the Court of Justice of the European Union (CJEU) in Tele2, wherein the access to data collected was to be given only to law enforcement agencies for the limited purpose of fighting serious crime, and the law in question prescribed the retention of data only for a limited period of 6 months unless otherwise provided, after which it was required to be erased irretrievably, but the court held that even for the purpose of prevention of serious organized crimes like terrorism, the law failed to meet the test of proportionality. “Under the Aadhaar project, the data shall be deleted after 7 years,” remarked Arora. She indicated the impact of surveillance as mentioned by Fali S Nariman in his book “Before Memory Fades”. She also referred to renowned jurist Jeremy Bentham’s idea of a security institution, known as the Panopticon. The Panopticon is an architectural creation, within which constant and round-the-clock watch can be kept on the inmates, workers or patients. The characteristic feature of this arrangement is that there is a complete asymmetry of knowledge, and hence power. “The Aadhaar scheme is like a Panopticon”, she remarked. Thereupon, senior counsel Sajan Poovayya advanced submissions on an intervention application by former Karnataka High Court Judge Justice Anand Byra Reddy. He referred to the 1983 decision of the Federal Constitutional Court of Germany in the Census case in which it was observed that the right of informational self-determination has its roots in the constitutional guarantees of personhood and human dignity, and it accords the individual the liberty to decide about the disclosure as well as use of their personal data. He submitted that Section 57 of the Aadhaar Act of 2016, in so far as it allows even non-state agencies to mandate Aadhaar, is not bad in law, but the open-ended definition of ‘biometric information’ in its Section 2(g) is bad in law. “Even DNA may be collected under the Aadhaar scheme in view of this definition,” he remarked. Finally, he urged that the bench consider the principles of the General Data Protection Regulation (GDPR) in determining the need for a less-invasive option in view of the absence of any concrete mechanism for data protection in India. In his turn, senior counsel PV Surendranath reiterated that the Aadhaar project does not pass the tests of Articles 14 and 21, in view of the scheme being “inherently and intrinsically arbitrary”. Seeking to emphasize on the unreliability of fingerprints, he referred to the 2004 instance where the FBI had arrested Portland-based lawyer Brandon Mayfield in the Madrid train bombings because allegedly his fingerprints had been found on the bag of detonators connected to the bombings. Later, the Spanish National Police had identified the fingerprints as belonging to an Algerian national. Senior counsel CU Singh, appearing for Joshita Pai, Beghar Foundation and the Nagarik Chetana Manch, emphasizing on the violation of the rights of children on account of the Aadhaar scheme, referred to Article 16 of the 1989 Convention on the Rights of Child, providing that “No child shall be subjected to arbitrary or unlawful interference with his or her privacy, family, home or correspondence, nor to unlawful attacks on his or her honour and reputation”. He further referred to the principle of non waiver of rights, principle of right to privacy and confidentiality and principle of fresh start in section 3 of the Juvenile Justice Act of 2015. “These are the guiding principles the State must adopt,” he remarked. “A child is not allowed to Contract, engage in dealings of property or even operate bank accounts...there is no valid state interest in mandating Aadhaar for children,” he submitted, referring to sections 2, 10 and 11 of the Indian Contract Act of 1872. Relying on the right to education under Article 21 A, he advanced that the Aadhaar projects makes this constitutional right subordinate to and conditional on the procurement of Aadhaar. He also referred to the portions of the Justice Puttaswamy judgment wherein Justice DY Chandrachud and Justice Sanjay Kishan Kaul have dealt with ‘privacy qua the child’. He repeated the grounds of surveillance, illusory consent, failure of biometrics and safeguards for data protection. 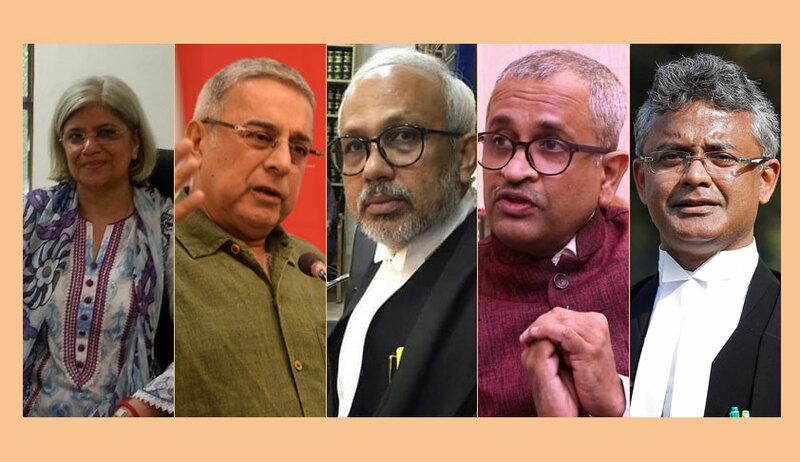 Thereupon, senior counsel Sanjay Hegde advances his submissions in the light of the freedom of conscience, which he differentiates from the freedom of religion, in Article 25. He submitted that the son of his client, a Christian by faith, has been denied college admission for the want of Aadhaar, which he cannot procure for religious reasons. He stated that Christians relate Aadhaar number to “the beast”. He relied on the ‘Book of Revelation’ in support of his contention. He also drew the attention of the bench to the dissenting opinion of Justice Vivian Bose in the 1951 judgment of the apex court in Krishnan v. State of Madras. Thereupon, Advocate Jayna Kothari appearing for an intervenor made arguments on the rights of transgenders and sexual minorities, submitting that the said classes cannot procure Aadhaar for the want of gender identification documents. She relied on the 1998 judgment of the Supreme Court of Philippines in Ople v. Torres, wherein the Court had invalidated the “Adoption of a National Computerized Identification Reference System" on two important constitutional grounds, viz: one, it is a usurpation of the power of Congress to legislate, and two, it impermissibly intrudes on our citizenry's protected zone of privacy. Advocate N.S. Nappinai voiced the concerns of the NRIs and their inability to obtain Aadhaar. “There is no rule of law so far as the NRIs are concerned...one such individual had to quote an acquaintance’s Aadhaar number to obtain a telephone connection”, he submitted. The arguments on behalf of the petitioners concluded on Tuesday. The Centre shall commence the submissions on Wednesday.